Have all your supplies assembled before you start your Spring cleaning. I use vinegar and/hydrodren peroxide for cleaning everything! I make a habit of using only cleaners that don’t harm the environment or my kids and pets because some of those regular cleaners are very stout smelling and have toxic chemicals that I have trouble breathing when I use them. 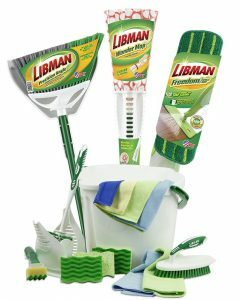 I love Libman products great price! Purge thru your items. If you haven’t used it in a while then it’s time to toss it.